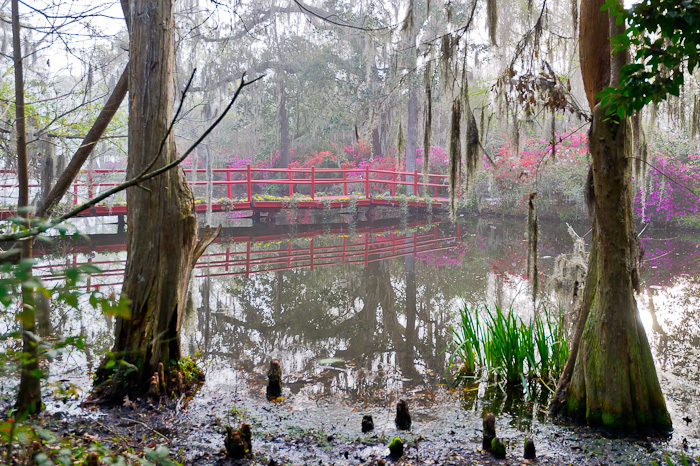 So, my parents have lived in Charleston, South Carolina for 25 years now, but for some reason I’d never visited Magnolia Plantation and Gardens, one of the area’s most popular scenic destinations, until this spring. But I think it was worth the wait. I convinced my mom and Cameron to arrive at the 8 a.m. opening so we could still have some early morning sunlight to play with. A light fog had enveloped the area, though, and it actually provided for lovely morning shooting of the swamps and flowers before the powerful March sun broke through to illuminate the blooming azaleas and camellias. Because of several intense deadlines the past few weeks I’ve not really had time to edit my images, but I picked this one, the very first shot I took that day, as the letter “M” for this week’s A-Z Archive Challenge. I look forward to exploring more Magnolia Plantation images in the near future and do plan to visit again well before their next 25th anniversary. Thanks, yes, they’re just beautiful when they’re in full bloom. I bet it is a lovely place to visit. Would love to see more of you images! Thank you, David! So glad I finally got there. I’m hoping to post some more later in the week, including some fun bird images!